Kickstarter’s a place for all types of dreams: promising, unfulfilled, broken, realized. Some of those may be classified as Nightmares. The Kickstarter Hotline Miami Jacket Figure by Dennaton, Devolver Digital and Erick Scarecrow of ESC-Toy Ltd is the sweetest, most beautiful nightmare I never want to wake from. That’s not to say this Hotline figure of the game’s protagonist Jacket is a nightmare due to flaws in its design, or troubles with its Kickstarter campaign which launched in August 2014. After close to a year since that launch, the figure is now a tangible thing that I’ve held, fawned over and love. It’s actually pretty damned near perfect and anything but a failed Kickstarter project. But this is the nightmare of a game that I’ve a rather unhealthy obsession with. The Hotline Miami series is one of the most creative, sincere, brutal, engaging, “every-bad-assed-adjective-I-can-throw-at-it (and have)” kind of series I’ve played in a long while. I still spend many nights listening to that killer soundtrack. Is it too early to declare that this game has the best soundtrack of the year? The nightmare is in every squishy sound, bloodied bat and splatter, and mind-bending conspiracies of the games’ elusive story that I can’t get over. It’s just that amazing and terrifying. This Jacket figure is a reminder of those experiences. It’ll be standing over my head as the last thing I see at night before drifting off to all those weird dreams that await. Hopefully it’ll not be the last thing I’ll see ever, given Jacket’s murderous tendencies… but at least I’d be going out with style. Though if “Le Perv” is playing when it does, even better. In all seriousness, this ⅙ scale “12 inch” figure with its 15 points of articulation is something else. Though I will say that even those were created with different cloth to detail a colour scheme for the Letterman B jacket. It’s a nice touch, for sure. Details such as the metal push buttons on the jacket are just ace. His sneakers for all those sneaky attacks and quick movements are miniature versions in plastic wonder. And let’s not forget those jeans. It’s all 80s with these jeans, which is the timeline in which the first game was set. Terrible, cheesy style captured perfectly in that blue denim. The jeans and Jacket’s white t-shirt (which is made from some nice, soft material) can easily be removed due to the use of velcro for its clasps. The plus is that they’re hidden nicely and don’t distract. Yeah, it’s just clothes and lots of figures do this but it’s well-put together, of good quality and a great representation of Jacket, and that’s what counts. I like the articulation and joints for the hands and feet. It feels sturdy. There are figures that do a lot more but I don’t need this Jacket to do all the acrobatics. It’s sufficient—enough for some cool poses Jacket would do in context of being who he is—and well-made for the most part. One of the selling points of the first Hotline Miami was that Jacket was a man of many masks, among other things. As the player, you could select from 25+ masks ahead of every mission, each with a special ability to tear through the levels according to play styles best suited to your needs and desires. While I really would have loved a Rasmus mask (because who freaking doesn’t want a deranged owl crushing up your apartment—and some do! for an extra $33, the Rasmus mask was an added bonus), 3 of the most popular “personalities” in Mask fashion were chosen for inclusion with the base figure. There’s Aubrey the Pig: a mask created and named after Aubrey Serr (the main artist for Wolfire Games), and also notably known from the crazy, awesome Hotline Miami cover art by Niklas “El Huervo” Åkerblad, in which Jacket is seen wearing the mask. It’s got every demonic, devious wrinkle going. It’s the scariest mask for sure. There’s Tony the Tiger and it’s g-g-g-great! The open mouth has always been really scary and a lot of comical for me because it looks like a huge grin. I’m sure not so comical if a guy in this mask approached me but that’s neither here nor there. There’s the Richard (a Rooster) mask because the figure would be incomplete without one. Richard is a lot of things and I’m still not sure exactly what, but his role is vital to both Hotline Miami and its sequel Wrong Number. Oh, but it’s just a mask you say? Not quite. But that’s a story for another day. Finally, there’s Jacket’s real face hidden behind a series of bloodied bandages from that time he ended up in the hospital. He’s even got one of those hospital gowns to recreate the dizzying, intense nature of that particular scene. Blurred vision and sickening shifting, swerving walls are not included. And I’m okay with that. I also won’t be removing his jeans for that authentic Hospital Trauma reenactment. What do you guys think this is? Pfft. Hotline’s about masks, ultra-violence and a lot of different things that are open to interpretation. But there’s no ultra-violence unless there are copious weapons involved. Fists—check. Katanas—check. Shotguns—check. Baseball bats—check. There are loads more in the game (and some as added bonuses for a bit more money) but these suffice for the basic figure. My favourite of the Hotline Miami weapons—the knife—is not represented here but that’s alright. I’ll live. If I get really desperate for change, I can easily get a bottle of beer from one of my other questionable figures if I really wanted to simulate the broken bottle style of destruction for Jacket. Fortunately, I’m certain there are enough weapons to launch a small attack on deserving chumps in this arsenal. One of the coolest things about some Kickstarter projects is achieving Tier goals. Doing so unlocks a whole of bunch of cool stuff you didn’t know you needed. In this case, bonus items range from all sorts of endearing in-game nods like a special polaroid and an old-timey 80s brick of a phone. They all make sense for fans of the series and it’s these little attentions to details that make this already thoughtful package even more swoon worthy. The love for this game shows in all those little extras. Then there are the heap of bonus items that came packaged in the box along with the figure. Two posters with some crazy awesome art of another Hotline character Helmet and another of Jacket busting a head. The metal pins are a beautiful addition too and if there’s one thing I’m a sucker for, it’s some pins. A Lanyard? Okay. Sure. It’s adorned with the great art from the first game. It’s creepy as all heck in lanyard form. But oh so beautiful in the box packaging which is the official cover art from the first game. Just looking at the box makes me giddy. Again, El Huervo is a great artist and this packaging couldn’t be better. It’s classy and a great addition for fans of the series and collectors. Hotline’s got a whole lot of style and this overall packaging is expertly done and a great tribute. I know, I know. This is actually not a true complaint as it’s such a minor thing and probably designed specifically as is for a reason. For many years I’ve struggled with removing parts, always living in fear that I would pull something too hard and break it. That’s not a problem here. The heads come off really easily but almost too easily. It’s not a really awful thing and I don’t actually plan on moving this figure around to wreak havoc on any unsuspecting Russians, but it’s just a little thing I noticed, particularly when the connecting joints for the hands are so sturdy. Alternately, the shoes take a little bit to pry off Jacket’s feet. This is where the well-made joints really matter. Again, it’s a minor thing that a little pressure will take care of but it’s a tad scary taking those shoes off, or it was the first time I did. I thought for sure I’d break his foot but there’s not much to fear. I think it might be a very minuscule thing in the grand scheme of things if you wanted to frequently switch between Jacket’s hospital outfits and his regular clothes. It’s understandable the shoes wouldn’t just be able to slip right off too though, all that said. There’s something else about Kickstarter that’s a bit of a double-edged sword and that is... it’s kind of cruel in its tier structuring. At $85—which is what this figure is—you will be the proud collector of your very own basic Jacket. That means no bloody “Soaked” special version that sits pretty red at the $200 tier. Nor will that secure the Midnight Miami Marauder with alternative, neon colours matching the game’s distinct visual acid trip style. That version goes for $100. This is definitely not a knock against the campaign, at all. It was a very cool tier system with fun rewards. All involved created a great figure with treats for fans of the series. I’m just being salty because I want all the Jackets*, on account that all versions of the figure look so damned cool. 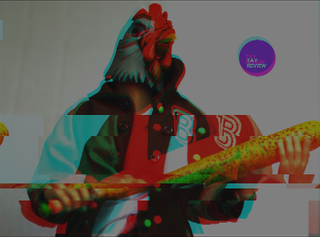 It’s great to be a Hotline Miami fan. The violent yet touching indie gaming experience with its undeniable style and charisma, now has a fantastically beautiful figure in Jacket that’s an absolute dream. Additional full-length pic and an Aubrey special here.